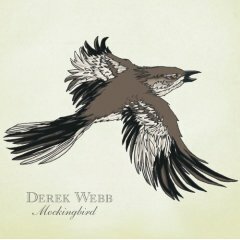 I just recently treated myself to a new CD from Derek Webb; Mockingbird. If you're looking for something worth listening to this is it. Now, I've recommended a lot of books before but never a CD. What's special about this album? It's real. Most "Christian music" is pretty much about God, how cool He is, and what great stuff He's done and is doing. Am I right? It's all well and good but it's getting a bit cliche'. Derek Webb breaks down the walls of what we've labled "Christian music." His lyrics are a call to social reform. They're a call to follow Christ the hard way... the right way. He doesn't waste a line and each one rings truer than the last. This music is about God and culture. It's more than just pretty music. It's theology, it's philosophy, it's challenging, thought provoking, and down right awesome.